I posted recently about switching over to M. Graham watercolors (which, bless the folks at M. Graham, don't dry rock hard when left in my palette like most other watercolor paints do) and then posted a color chart I'd made with my new working colors. Various comments were left on my blog about the paints and the chart (thank you so much.... visits and comments are most welcome and appreciated) including one comment left by my dear friend, Jeanne, whom I've dubbed "CA". She's in California..... hence the nickname. What she said was - and I quote - "Hurray you posted. Now post something you painted. lol"
Hmmm. Kind of ups the ante, doesn't it? Jeanne is acquainted with my unfortunate tendency to get sidetracked with all kinds of worthy distractions and then my painting time gets short shrift. But now she'd thrown down the gauntlet! My honor was at stake! (well, not really... but painting time was). Thus motivated to push aside the excuses, distractions, delays and all other spoilers of art time, I jumped in and started painting. And loved it. 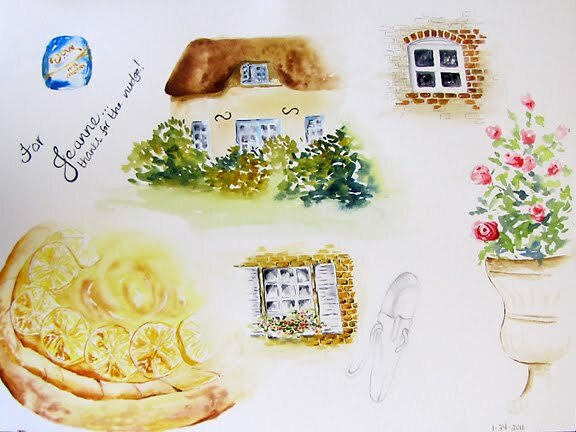 I experimented with pen, ink & watercolor (something I've always loved the look of and meant to try out "sometime") by doing a couple of windows and brickwork; did the vase of roses in an uncharacteristically loose style; had fun with the thatched house, lemon pie and the Dove chocolate (and if you're thinking I bet she ate the chocolate the minute she finished painting it... you'd be right.... the paint wasn't even dry before the chocolate had disappeared). Thanks Jeanne for the nudge... I needed it! I love this, Teresa- It looks like pure fun, too! Especially love your beautiful lemon pie! Hummm! une bonne tarte au citron, quel délice!!! these are great. I love the little house and rose bush as well. they are all fun and good for you to 'finally' paint. I do the same thing. Just making myself get everything set up takes away from it, so I don't set it up as often as I think of it. Love the experiments! Now I'm wondering, did you make the pie as well?! Glad I was sitting down when I saw that you'd posted! LOL!! Nice job on the techniques.....now, what about a painting with those glorious M. Graham paints????? She probably did make the pie. she cooks more than she paints. lol I have never seen a lemon pie with slices of lemon on top. Wonderful results! So fun to see what you've painted. I'm totally amazed with the detail in the lemon pie. Yum!! You've gone all Von Trapp. It's like a paint version of 'A few of my favorite things"
She paints! :-)) These are just delgihtful. I like the brilliance and intensity of the colors. Those painstaking brickworks are wonerful, T.
Thank you for sharing the lovely story and below, the info of products. Enjoy painting!! Love your watercolor sketches and good info on the paints. Might try them sometime! Lovely, lovely, lovely! You are so talented. Can't wait to see more! Wonderful paintings Teresa! Especially love the window flower box filled with flowers! nice job. These are so wonderful, Teresa! So glad to see your paintings again! It's been such a long time! I love them all, but there's something about that lemon pie - yummy! Teresa, It is so easy to get distracted from whatever our art is. I have an unfinished painting sitting in my dining room that I haven't touched since my painting partner died. I really mean to work on it this month. Lovely work Teresa. It all looks so dainty and the M Graham paints look wonderful or is it the artists touch. ;) The pie looks yummy. I'm glad you got to purchasing the M Graham paints. Makes me want to try them too. LOL hope you enjoyed the chocolate. Looks nice! I like the colors! They look rich! I could have sworn I commented on your wonderful little paintings! Even if I did, I'll say again how great they are! I may have to get some M.Graham gouache as I hear it's as good as the watercolor. If I get some, will I be able to paint as well as you?